How do Hawthorne's descriptions of Hepzibah and Esther underscore their connections to the past? What words does he use to describe their appearance, attire, and environments to suggest the close ties they feel to the past? How do the illustrations and images reinforce Hawthorne's ideas? b. Both Seven Gables and the Province House contain mirrors that seem to reflect the presence of figures from the past. Examine the passages in which Hawthorne describes the mirrors. What appears in each? How does Esther feel about the images she sees? What does the narrative suggest about the images that appear in Seven Gables? c. Hepzibah and Esther share certain qualities, but are also different from each other. What differences do you see? How does each woman feel about the past and its legacy? Is this an important difference? d. The endings of "Old Esther Dudley" and The House of the Seven Gables present different outcomes for these two women. Look closely at the excerpts from the endings. How does each work offer a comment on the relationship between past and present? Which outcome do you prefer and why? excerpts from the ending of "Old Esther Dudley"
2. As Richard Millington suggests in his critical commentary, the story "Rappaccini's Daughter" would be quite different if written by Margaret Fuller. 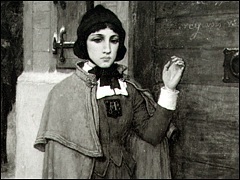 She might have changed the point of view so that the reader saw things from Beatrice's perspective. To see what effect this might have, imagine that you are Beatrice. Since you have no one to talk to, you record your thoughts in a diary. Write the diary entries that describe your meeting with Giovanni and the way you feel as you continue to see him. What are your hopes for the future? Compare what you have written to the story by Hawthorne. Has your view of Beatrice changed? Do you see Giovanni or Beatrice's father differently than you did before? How does point of view influence your perceptions? 4. As many of the images featured in this section suggest, the figures of Beatrice from Dante's Divine Comedy (Purgatorio) and of Beatrice Cenci informed the characterization of Beatrice Rappaccini in Hawthorne's story. Like many other nineteenth-century artists and writers, Hawthorne was attracted to the image of woman as a redemptive figure who transforms another through love (Dante's Beatrice). He was also fascinated by ideas about woman as a mixed being who represented both innocence and danger (Beatrice Cenci). Read material on the two Beatrices from the web sites "Dante's 'love' for Beatrice" and "Screaming in the Castle" . How has Hawthorne drawn upon these two figures to shape Beatrice Rappaccini? What important differences exist between Hawthorne's character and her predecessors? 5. This learning activity was submitted by Donna Reiss, Professor of English at Tidewater Community College, Virginia Beach, VA.
Two of Nathaniel Hawthorne's best-known short stories are excellent companions to a reading of Mary Shelley's Frankenstein: "The Birthmark" and "Rappaccini's Daughter." Like Frankenstein, they dramatize the impact of science and technology on human behavior and relationships. Although set in the nineteenth century, these works provoke our thinking about similar issues in the current century and help set the stage for an exploration of these issues throughout the twentieth century. This Explore activity focuses on "Rappaccini's Daughter," but the topics are also relevant for "The Birthmark." · The Literature section of the Hawthorne in Salem Website has several topics that you can relate to your reading of "Rappaccini's Daughter." Even when the sources do not refer specifically to that story, sometimes the authors of the online articles discuss other Hawthorne works in ways that you can recognize as similar to "Rappaccini's Daughter." In particular, the sections titled "Women in Hawthorne" and "Alienation" might be of interest. · In addition, the Explore section links to some graphical and resources and other commentary that might interest you. Ideas of good and evil, for example, are emphasized in the Faith and Religion section. 6. This learning activity related to "Lady Eleanore's Mantle" was developed by Dr. Melissa Pennell. Where does it break out? In your opinion, after studying about smallpox, does Lady Eleanor appear to have symptoms of the disease? How is it affecting the people of the city? Why were the citizens so fearful of this disease? How many would have become sick? Who is Cotton Mather and why is he important to the story? How were the first inoculations performed? Why might Hawthorne have chosen this disease for his story? Were you vaccinated? Find at least 3 people who were (hint: check with your parents). Were they re-vaccinated to travel outside the United States? Does smallpox still occur today? List several of the current questions surrounding smallpox and outline the current vaccination program. How might an author today use smallpox in a story?